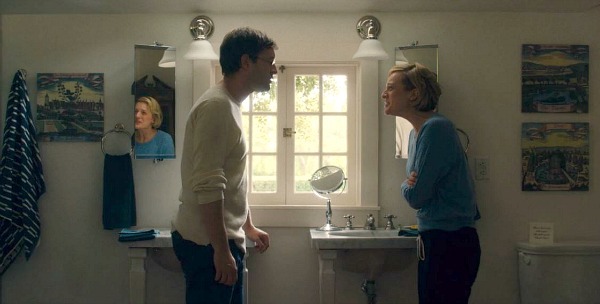 In the 2014 movie The One I Love, Mark Duplass and Elisabeth Moss play a couple whose marriage is falling apart. Their marriage counselor (Ted Danson) prescribes a weekend getaway in a charming white house where everything looks picture perfect. But — spoiler alert — it isn’t. In fact, some really bizarre and surreal things start happening to them there that force them to reevaluate themselves and their relationship. Not only were the houses in the movie beautiful, but I instantly recognized the enchanted, rose-covered guest cottage as one I’ve featured on my blog before. It made me do a double-take when it appeared onscreen! 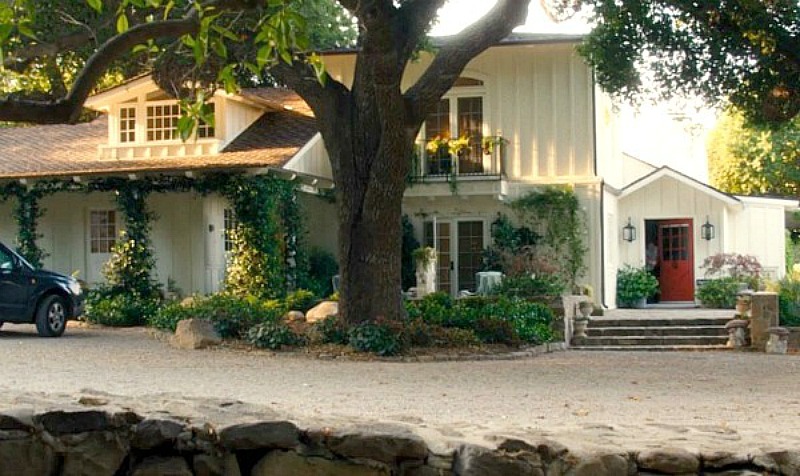 In real life the cottage belongs to Ted Danson and Mary Steenburgen and acts as their guest house in Ojai. 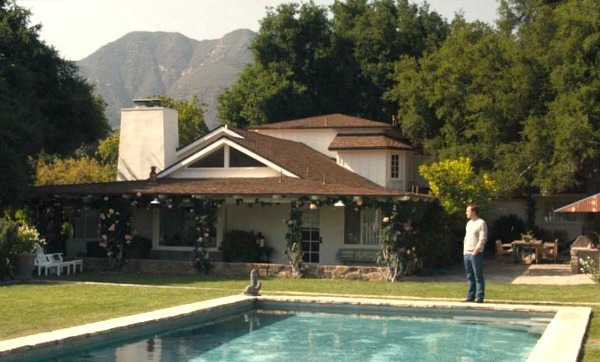 Their main house is also featured in The One I Love. Take a look! where many of his other clients have managed to renew their marriages. but let’s just say I didn’t see any of it coming! I recognized the cottage as the one on Ted Danson and Mary Steenburgen’s property. (his dad is the well-known actor Malcolm McDowell; Danson is his stepdad). 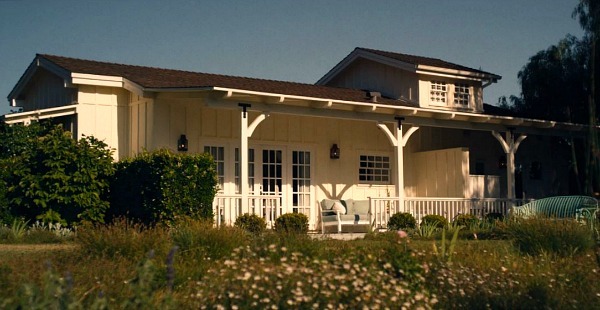 I loved this guest cottage when it was featured in Houzz, so I was excited to see more of it in the movie. you can see they didn’t change much (if anything) in the rooms for filming. Actor Mark Duplass says a lot of the dialogue was improvised. They were given the basic direction for the scenes and went from there. Besides the brief appearance by Danson, Moss and Duplass are the only actors in The One I Love. It was easy to believe that this adorable little house had a bit of magic in it. Danson and Steenburgen hired architect Chantal Dussouchaud to design the cottage for them. we wanted a space that pays homage to writing,” Steenburgen told Houzz. I’m glad your readers told you to check this out – as always, I’m inspired! Not only will I check out the film, but seeing as this is the second time this week I’ve noticed black metal curtain poles in fresh but cosy rooms with pale walls, I’m thinking the universe is telling me I need a few black accessories to make my bland rooms sing! Thank you for all the time you spend choosing and uploading the ‘best’ bits for us to drool over! Now I want to see this movie..love the place! Ted Danson + Mary Steenburgen are one of those couples that you hope is happy when you see them. Re: their cottage — now I want to paint our front door red, like theirs! I also think that we need a Hooked on Houses weekend in Ojai. Who’s on board? What precious cottages! Love them both,and I will have to check out the movie as soon as I can. Thanks for doing all the research and sharing them with us! Thank you for showing up close pics of the cottage and main house. Love that window in the kitchen. The cottage is so cute! Love the movie. Hmmm…that doesn’t ring a bell. I’ll have to look for it — thanks! Darling house and thanks for the movie recommendation. I always tell my husband that I like movies with pretty houses and great wardrobes. Love your blog. I do have room in my entrance way to build bookcases. And I love books. But I’m not sure if I could cope with the busy-ness everytime I came in the front door. OMG! We just watched this movie a few weeks ago. It gave me a very weird feeling by the end, though I loved it and I totally loved the house. I kind of thought it looked like Ojai (I live in Ventura nearby) so was really excited to see this article. Thanks! Oh, Julia! Thanks for this one! I go weak-kneed when I see floor-to-ceiling bookshelves, and the cottagen behind the pool is just perfect. Yes, like everyone else, I will be tracking this film down so I can see it al. Thanks! Ooooh, I love this house and cottage! I’ve always wanted a wall of bookshelves. Looking at this place makes me think I’d like the people who live there. Hi Julia I’ve just this movie to must see list. I couldn’t have high bookshelves I’m too short so I had a book cabinet made in olive green, glass doors about 6′ w x 4.5 tall, gorgeous Mackenzie Childs scented tassels hanging from the door knobs, made by a kitchen company, they did a beautiful job it’s quite striking in the lounge room. After all that, I can not compete with above book shelves and as for the rest of the cottage don’t get me started it’s beautiful. Thank you for sharing beauty. Regards Esther from Sydney. PS I’m going back to take a closer look. So I watched the movie on Tuesday because we had a snow day. Isn’t it? I just really didn’t expect that! It’s one of those movies I wasn’t able to stop thinking about after, for sure. I was just in Ojai last weekend for the first time. Beautiful area, I’ll be going back! Love this property, Ted and Mary have great taste!